Watching the celebrity gossip show, EXTRA. According to them, Monique's beauty contest show for fat women has taken the beauties to France for a glam photo shoot in which they're wearing only body paint. Mo'Nique is spunky, positive, and super-empowering. What else do I watch on TV nowadays? AGE OF LOVE - the reality dating show with 20-something and 40-something year old women vying to be the girlfriend of this guy Mark Phillippoussis who's 30 and has been to the Wimbledon and US Open finals. ...Can't wait to see what happens next Monday. Last episode's elimination was delicious: the woman was catty, toxic really, and the cut was swift as soon as he detected her "competitive" ways. I like the show, but don't like the terms "cougar" and "kitten" - eewww. The Science of Love, an hour-long "experiment" (and promotional machine for some dating site I've forgotten now) was super-cool too. You guessed it, I also enjoyed the many incarnations of The Bachelor and The Bachelorette. One of the big cultural adjustments when I came to America: men sitting pretty with women striving to bag them. In Nigeria, a show like The Bachelorette would have much greater appeal than The Bachelor. Men competed for chics, not the other way around. Oh well. I just made a picture to the theme of that song. All was drawn in an interface on the Metropolitan Museum of Art website. First came the Executive Company Head in the center of the paper. He's pot-bellied, in his home with a crucifix on the wall - there should be a Turner there somewhere too according to the song. Then there's little "I" looking at (and up to) the art teacher. ...really loved the copying and pasting - built an army, a field of flowers - pretty autistic. Don't worry it wasn't straight copy-paste, there was some realism: perspective, variety. Still, using a computer to draw wasn't the best way to relax from hours of using my eyes and a computer to "sequence processes for F1 build of the 2001 minivan" and my head really hurt from the strain. I just ate some left-over pasta - not just any leftovers, it's Bertagni, this stuffed pasta line at Trader Joe's. It makes me eat more. It makes me lick my own palate. There's something in the stuffing that I guess my body's been needing. I just finished the ricotta and reggiano cheese tortellini one. Before that there was "gorgonzola and walnut." Waiting in the fridge is an unbelievable pumpkin ravioli - the reason I now like pumpkin - and more . The pasta takes less than five minutes to make. My past Trader Joe's addiction: they had this bag of salted fluffed peas in a pod. 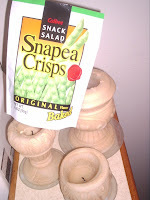 I couldn't help myself against an open bag of Calbee's SnapPea Crisps, even though each was 2.5 servings of high sodium stuff. I took a picture of the bag last year intending to write about it, then I found that someone else had written a blog post about The new "Crystal Meth" of the Snack Food World.